It is almost beyond comprehension that Sen. John Kerry (D-MA) and Sen. Joseph Lieberman (I-CT) will introduce the Cap-and-Trade Act on Wednesday, May 12th, for consideration by the Senate. It is being passed off as a “climate bill” with provisions for more oil drilling, but it is an assault on reality, on science, on common sense, and on any future economic growth of the nation. The nation’s prisons are filled with men still claiming to be innocent after trials filled with evidence of their guilt. 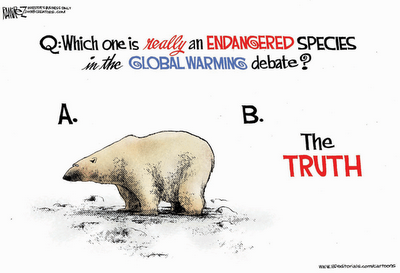 Denial of the truth is their last resort and this metaphor reflects what is happening in the utterly corrupt community of “global warming” liars and their associates in the U.S. government. Recently 225 “scientists” wrote a letter defending global warming. It was published in the journal “Science”, one of the many such publications that have become as corrupt as those at the center of the global warming scam. Based on last November’s leaked emails among those most responsible for the data at the heart of the global warming scam, it was revealed that the United Nations Intergovernmental Panel on Climate Change had been systematically publishing false climate information and analysis. Moreover, the photo used to illustrate the “scientists” letter was photo-shopped to show a polar bear on a small piece of ice surrounded by water. The deception included the fact that many of the signatories to the letter lack credibility. Among the first 20 listed, none work in the field of climate science. There is no global warming. Whatever warming occurred followed the end of a mini ice age that began around 1350. Around 1850 the Earth’s temperature increased about one degree Fahrenheit to its current level. The United Nations has been the locus of the greatest hoax perpetrated in the modern era, codified in the bogus Kyoto Protocol, an international agreement that many nations signed onto in1997. The Clinton administration signed the agreement, but did not implement it due to a Senate resolution that unanimously rejected it. The real aim of the global warming scam is the prospect of selling “carbon credits” in exchanges around the world, in effect selling air! If the Cap-and-Trade Act is passed at the urging of the Obama administration, it will constitute the greatest tax on energy use in the history of the nation and it will energize exchanges, such as the one in Chicago, set up to buy and sell the carbon credits. The European Emissions Trading System is a warning to America. IBD described it as “a scam built upon a scam.” British and German law enforcement authorities have been busy arresting miscreants “as part of a pan-European crackdown on carbon credit VAT tax fraud.” And VAT, a valued added tax, is being advanced in the United States as a way to raise money to pay off our ever increasing debt. The entire global warming theory has been a scam, a hoax and a fraud from the day it was first put forth. Its advocates, corrupt scientists, corrupted science journals, and all of the environmental organizations are hoping the same Congress that foisted Obamacare on Americans will do the same with Cap-and-Trade. I wrote both my Senators and Represenative..
Just to remind them this is what got Bernie Madoff arrested. Also, that NO One is above the LAW! "Also, that NO One is above the LAW!" ...and we have the American Revolution as proof. Good for OI JAMES, and I wish that everyone would do the same. Since I live in the SF Bay Area, we have no representation, but we need to raise holy hell about this one. Thanks to Alan for his accurate warning on the "warming". Alan is right on and always has been on climate change. A friend of mine who is an ex-electric utility executive told me that a US Senator told him twelve years ago that Democrats were going to pass cap and trade not because of a concern for the environment but because it was a hidden way to tax Americans. It was also a way for a few charlatans to make money as well as Alan discusses. It's completely obvious that this has nothing to do with the environment. It's all about creating an entirely new "market" for these charlatans to play with. The big difference between this market and other markets is that it will be funded entirely by the taxpayers, and will become a giant slush fund of taxpayer dollars to be fed on among themselves like a pack of jackals. This is nothing but another way to impose a tax without calling it a tax. Keep hammering on this Climate Change nonsense !! Soon people may forget that its a scam and start believing it again - just like they forgot about the Federal Reserve after 1913, and the bankruptcy after 1933. I to send my Rep and Congressman articles on the bogus warming scam. Alan's articles are of course some of the best and I send those in their entirety with his name on them to my email list. Only the uninformed or greedy still give credence to this hoax and we're seeing exactly who they are. Thank you, gentlemen. My two NJ senators are either corrupt or senile, so I don't bother sending them anything. Both Dems, both liberals. It's disgusting. Why Are We Still Asking Why? Keeping You Safe in the Skies---NOT! Mice and Snakes, Oh My!